A great high quality low wattage kettle. 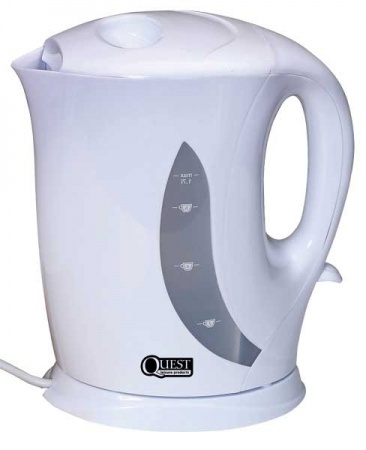 Made from high quality plastic this kettle has a capacity of 1.7L perfect when you want to make a few cups. The larger capacity means fewer trips to filling it up. It features and easy to read water level indicator on the side and a removable and washable filter in the spout. This makes this kettle easy to clean and maintain. The safety cut out power indicator light and manual override add control and safety to the kettle at all times. Being low wattage it draws very little electric ( 1000w ) which ensures it will not trip any campsite electric and ensuring you can use it anywhere. It is also cordless which means the cord is attached to the base and not the kettle. This means when you pick the kettle up it is not attached to the socket making it easier and safer to use. It also means you can leave the base plugged in where required and still fill the kettle without having to unplug the base. The small size 1.7 litre capacity gives it a very small footprint thus making it easy to store away when not in use. The power lead is attached to the base unit rather than the kettle which makes it much easier to use and safer in any environment. The simply white design is easy on the eye and blends in with most white goods in any kitchen area.